Are you feeling tired of the busy city life, the permanent traffic noise and the bunch of people around you while walking down the streets? Seems like it’s time for you to spend a day on the remote island Hiddensee in the northeast of Mecklenburg-Western Pomerania. This isle is not like any other in the Baltic or the North Sea, as you can’t go there by car or take one to get around. Hiddensee – which is only 19 km² big – is a car- & carefree spot which means that you can totally relax from all the stress of your everyday life. To get to Hiddensee you simply have to take the ferry from Stralsund or Schaprode on the neighbouring island Rügen which takes about 30 to 45 minutes. Do you ask yourself what to do on an island that is so tiny? If you love nature, there will be plenty of possibilities for you to enjoy your time. 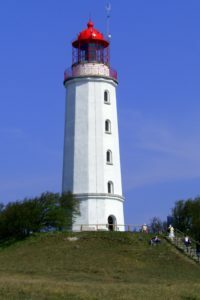 For example you can make a hike or a tour on your own or a rented bike from the harbour of Neukloster to the 28 m-tall lighthouse which is the landmark of the isle. There you can take a deep breath and admire the spectacular view over the rough coastline and nature of Hiddensee. If you still are looking for some cultural highlight, you have the opportunity to visit the vivid museum of local history in Kloster which shows the lifestyle of the islanders in the past and present. So, get yourself a day off and inhale the clear and peaceful air of the island Hiddensee. 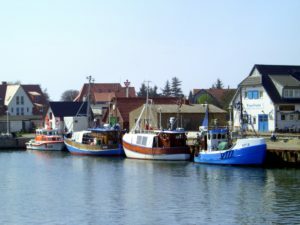 This entry was posted in Germany&MV: Do's & Don'ts, M-V, Mecklenburg Vorpommern, Travel Activites & Accomodation and tagged active, baltic sea, beach, historical buildings, Mecklenburg Vorpommern, Nature, outdoors, sport. Bookmark the permalink.